Origin and Habitat: This species has been reported from Brazil, Bolivia, Argentina, and Paraguay. Description: The typical Praecereus euchlorus (Monvillea euchlora) is a shrubby columnar cactus that grows often in thicket or clambering among other vegetatin, with rather slender ribbed stems, weakly erect at first, later arching or decumbent. The flowers are nocturnal, funnel-shaped, white to greenish white up to 8 cm long. Crested form: The crested forms are cultivated for their beautiful fan-shaped stem. These plants produce monstrous crests, and crests occasionally produce normal shoots. 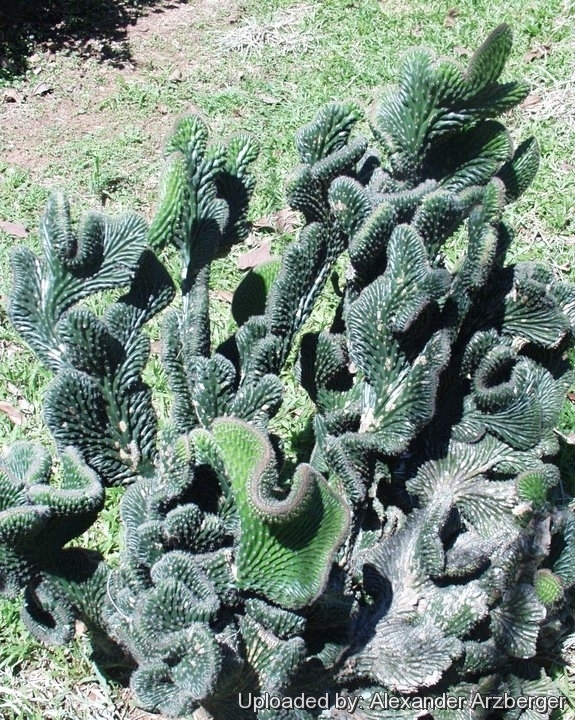 Crested specimens are often grafted on stronger species, called the stock, that can be any number of different columnar cactus. The odd crested forms are extremely rare and may appear both on seedling batches in a very small percentage and in habitat too.